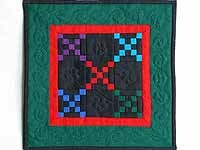 A bright Amish quilt for that special niche. Note the excellent patchwork piecing and fine quilting. Made by local Mennonite woman. Even includes tabs for a hanging rod! Wow! 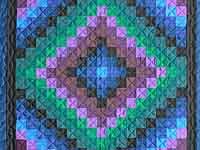 Has the look of a fine stained glass window. A design that is new to us, but hope we see more. Very well made by Lancaster Amish woman. Includes a sleeve for a hanging rod. A striking brilliant little quilt! 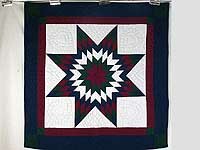 Well made with not only fine patchwork piecing but also lots of fine quilting. Made in Lancaster by an Amish woman. Includes a sleeve for a hanging rod. 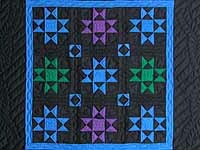 The Amish have been making this design since they first made quilts in the 19th Century. 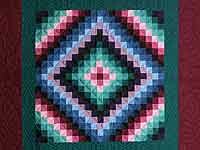 The border is black with Burgundy squares in the corners. The sash is forest green. The fill around the diamond is paper bag (light tan). Note the fine quilting! Made by local Amish woman who has include her initials in the quilting. Includes hanging tabs. One of the oldest Amish designs with traditional coloring. Very well made by Lancaster Amish woman (note the care taken with the quilting and piecing). Includes tabs for a hanging rod. We find the sparkle of Amish colored Sunshine and Shadow quilts amazing. 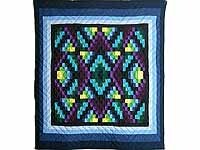 This quilt is distinctive because it doesn't have any burgundy or red fabric, giving it a more sophisticated look. Excellent piecework and quilting, note the stitching. Made in Lancaster by an Amish woman. Includes a sleeve for a hanging rod. Sparkling! We continue to amazed at how pleasing this simple design can be when it is well done. 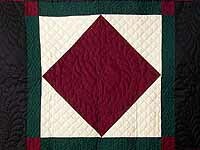 Note the care taken by its local Amish maker in the patchwork piecing and quilting. Includes tabs for a hanging rod. 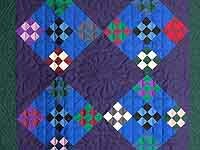 All quilted quilts are most prized by Lancaster quilt lovers. 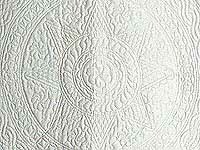 Their simple elegance and abundance of fine quilting make them most desired, and hardest to make. Unfortunately few are ever available. 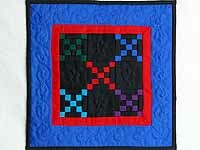 This small quilt would look especially nice on a table top. Made by a local Amish woman.